Black 2 and White 2 Battling: Royal Unova | Sailing along the sea of your dreams..
Costing you 1000, you can board the boat and find a rather large number of trainers for you to battle, the number of trainers you successfully battle having an affect on the item that you will be given upon the boat redocking at Castelia City. 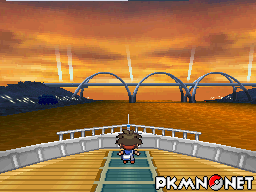 Hiding away in the various rooms on board the Royal Unova, you will encounter plenty of different characters; some of which will offer you items, some of which will request a battle, and some will even give you a prize after battling them. Even better, the trainers can be rebattled every single day, although the trainers and characters you will encounter vary from day to day in ways we're not completely certain of yet. The boat will return to Castelia City and dock up each day at the end of the time allocation given above. Upon your departure, you will be given one of the following items should you meet the requirement of trainers defeated; the item itself also varying dependant on what day it is. Below is a list of the Pokémon trainers that you will encounter on the Royal Unova, although like previously stated, this is entirely dependant on what day you are travelling on.. Page generated with 170 queries, excitingly.